The program is folded once to a dimension of approximately 5-1/2" x 4" and consists of twelve pages in addition to the covers. 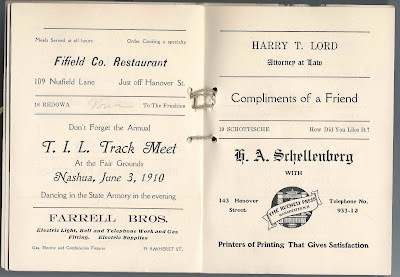 It consists mostly of advertisements of businesses and organizations in the Manchester, New Hampshire area, with one or two dances listed on most pages. One page lists the chaperons. 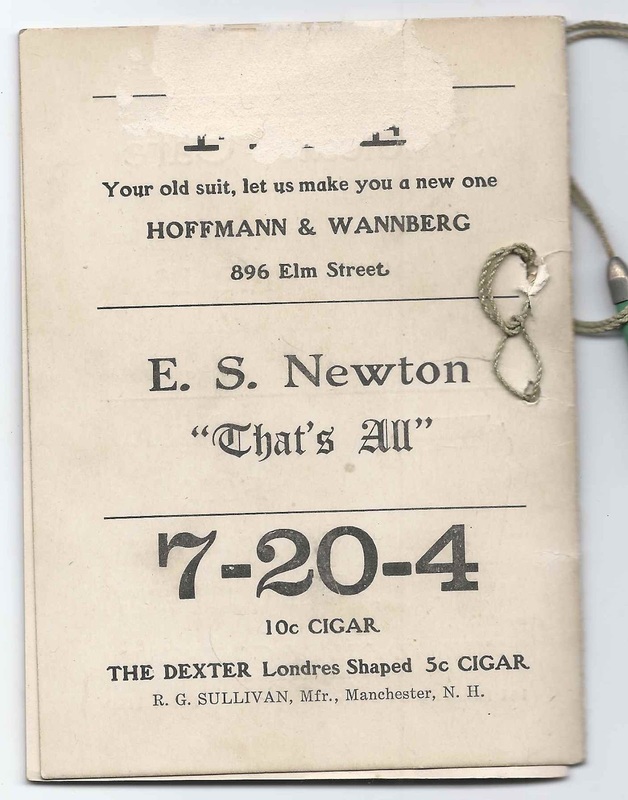 The original program owner, whose name was Whitney, according to a note at the top of the front cover, had a great time at the dance, as noted in pencil on the cover along the right edge: Greatest time on record. 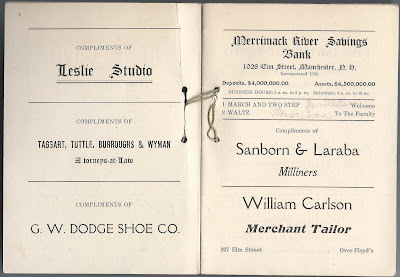 Left page: Leslie Studio; Taggart, Tuttle, Burroughs & Wyman, Attorneys-at-Law; G. W. Dodge Shoe Co. 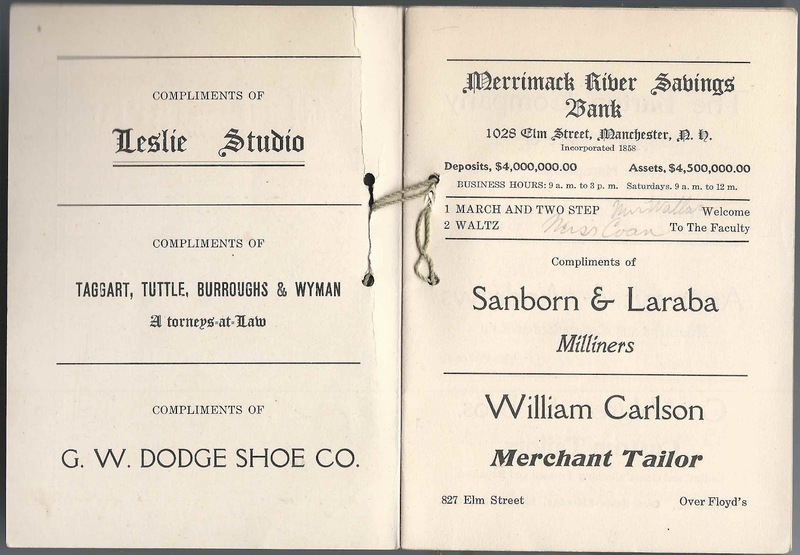 Right page: Merrimack River Savings Bank; Sanborn & Laraba Milliners; William Carlson, Merchant Tailor, 827 Elm Street, Over Floyd's. The two dances listed on the right page are 1) March and Two Step, with the name of Miss Wallace penciled in and 2) Waltz, with the name of Miss Coan penciled in. 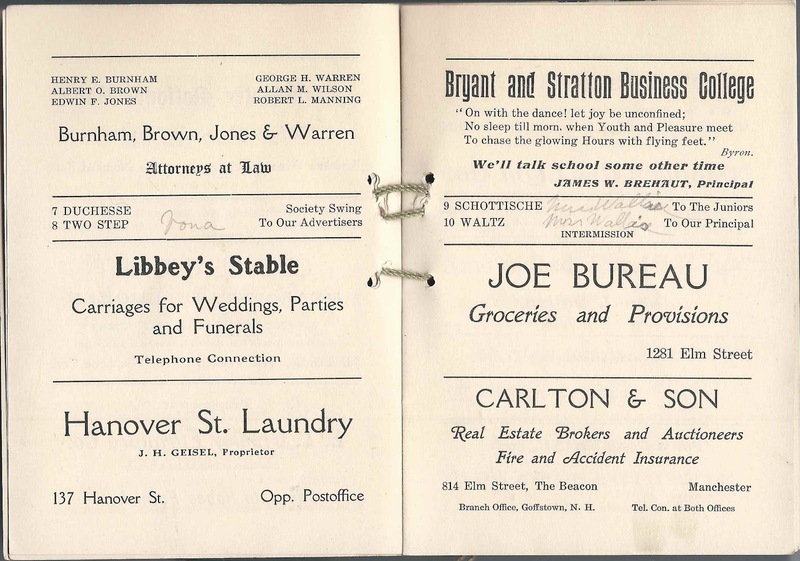 Left page: The Barton Company, Shopping Centre of New Hampshire; Andrews & Andrews, Attorneys; C. Ahlgren & Bros. 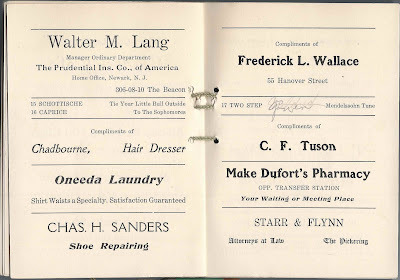 Custom Tailors, 852 Elm Street, Over Besse-Eldredge, Manchester, N.H. 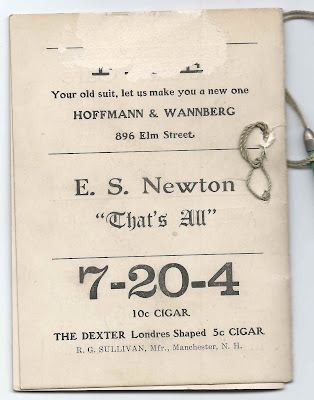 The two dances listed on the left page are 3) Schottische, "By the Light of the Silvery Moon, with the name of Sherman penciled in and 4) Portland Fancy, To the Seniors, with the name of Vona or Nona penciled in. 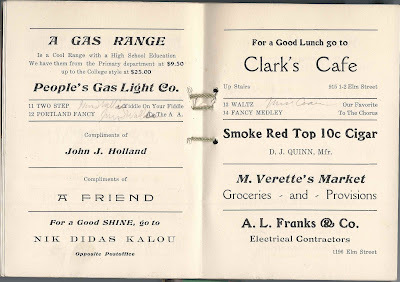 Right page: Manchester National Bank; Geo. 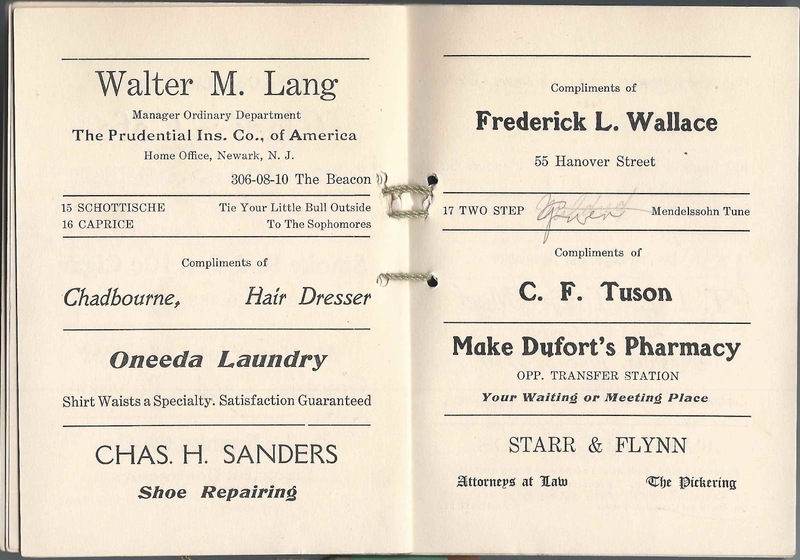 Blanchet, Real Estate Broker, 987 Elm Street, The Weston; E. L. Gresley Furniture Co. The dances listed on the left page: 7) Duchesse, Society Swing and 8) Two Step, To Our Advertisers. The name Vona or Nona is penciled in once, either for both dances or for #8 alone. 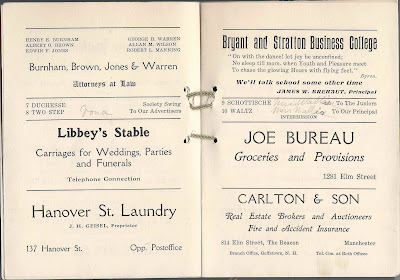 Right page: Bryant and Stratton Business College, James W. Brehaut, Principal; Joe Bureau, Groceries and Provisions, 1281 Elm Street; Carlton & So, Real Estate Brokers, Auctioneers, Fire and Accident Insurance, 814 Elm Street, the Beacon. 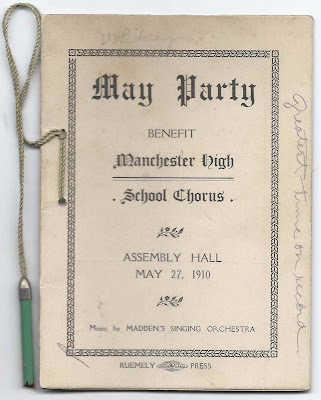 The dances listed on the right page: 9) Schottische, To the Juniors, with the name Miss Wallace penciled in and 10) Waltz, To Our Principal, with the name Miss Wallis penciled in. Miss Wallis may have been Miss Wallace. The dances listed on the left page: 11) Two Step, Yiddle on your Fiddle, with the name Miss Wallis penciled in. and 12) Portland Fancy, To the A.A., with the name Miss Wallis penciled in. 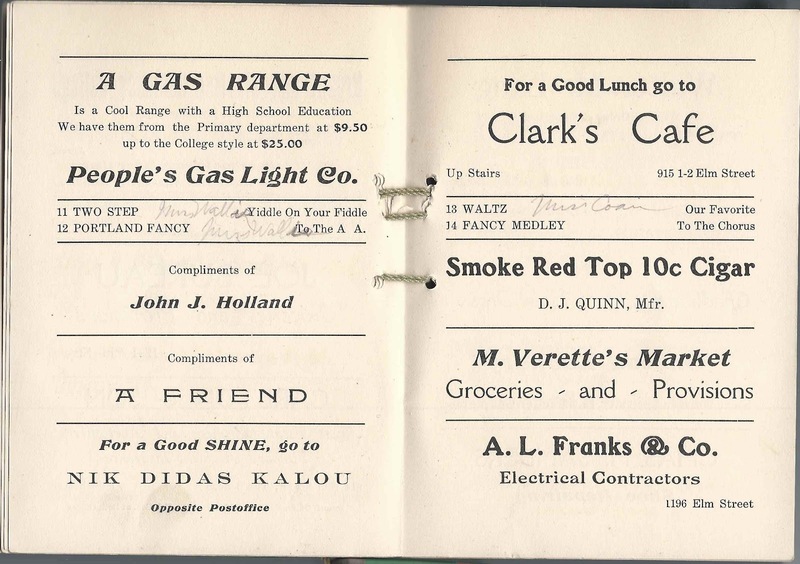 Left page: Fifield Co. 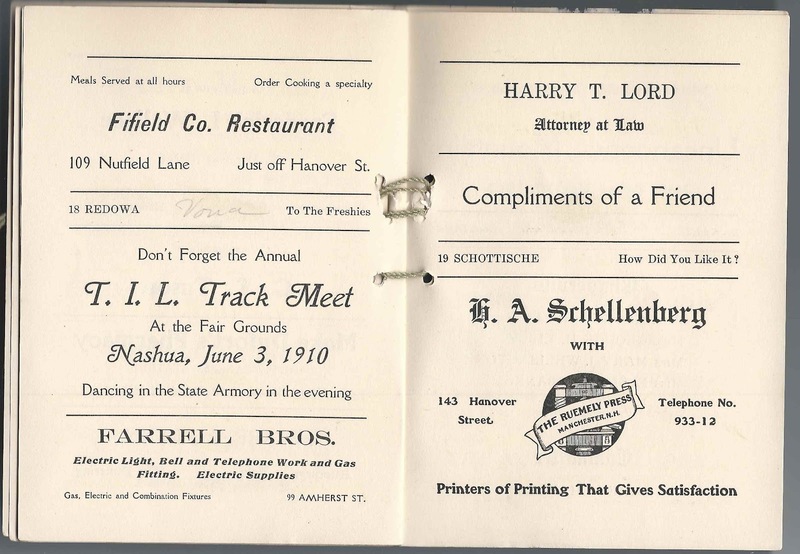 Restaurant, 109 Nutfield Lane, Just off Hanover St.; T. I. L. Track Meet at the Fair Grounds, Nashua, June 3, 1910; Farrell Bros., Electric Light, Bell and Telephone Work and Gas Fitting, 99 Amherst Street. The dance listed on the left page: 18) Redowa, To the Freshies, with the name Vona penciled in. The dance listed on the right page: 19) Schottische, How Did You Like It? 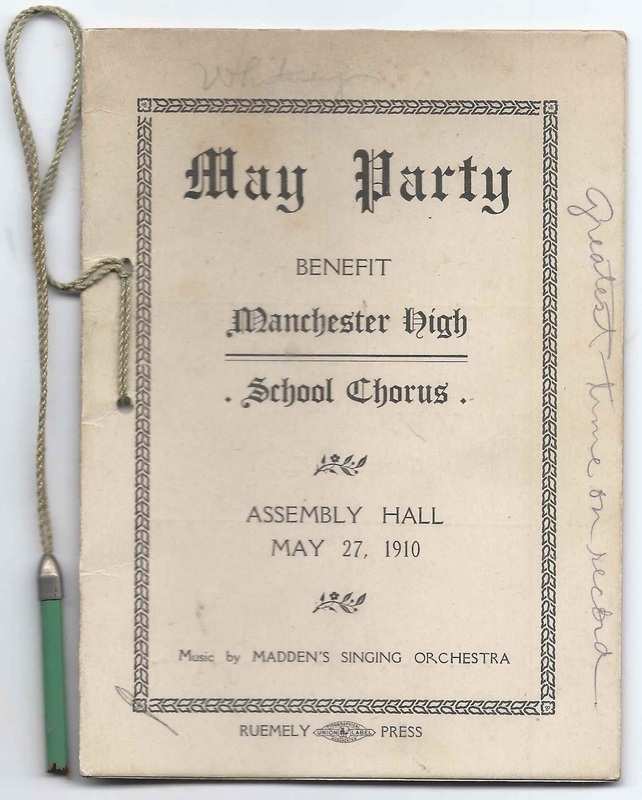 The dance listed on the left page: 20) Waltz, Good Night, with the name Miss Wallis penciled in.